Did you ever get so far behind in something that you thought about just giving up? Ever since we found out that Amara would be going to OCSA next year things have just gotten crazy busy! So many things needed to be done for the last time. 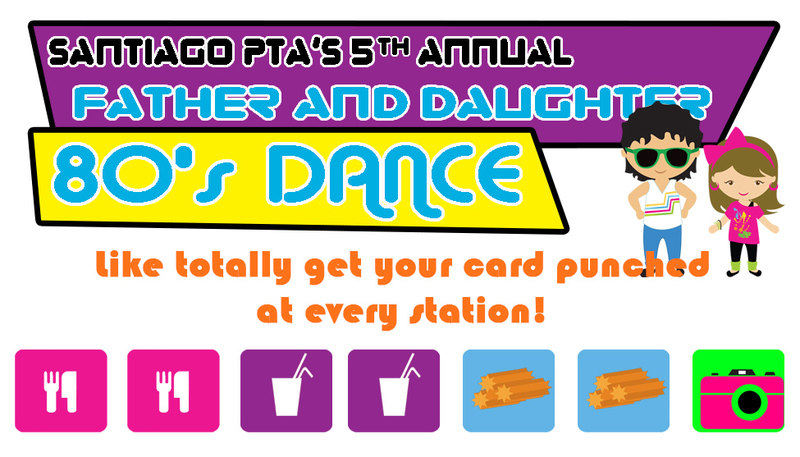 I may just give you the highlights on some of the events but the 5th Annual Father Daughter Dance definitely deserves a post all of its own! This year the theme was an 80s party and I think this was the most fun theme yet! Jenna created the cutest flyer and matching ticket. The dance committee had fun getting together to plan and create all the decorations. Pinterest gave us so many great ideas! Jenna had put a call out on NextDoor that she needed cassettes and boy did she score! She got boxes and boxes of them. Some that had never even been opened! She painted them bright neon colors and they were scattered everywhere. She also used them to make lights for the raffle tables but I didn’t get a picture of them. 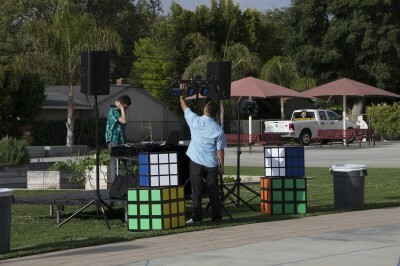 One of the mom’s with the help of her family created 6 HUGE Rubik’s cubes to set near the stage. Everyone wanted to take those home! 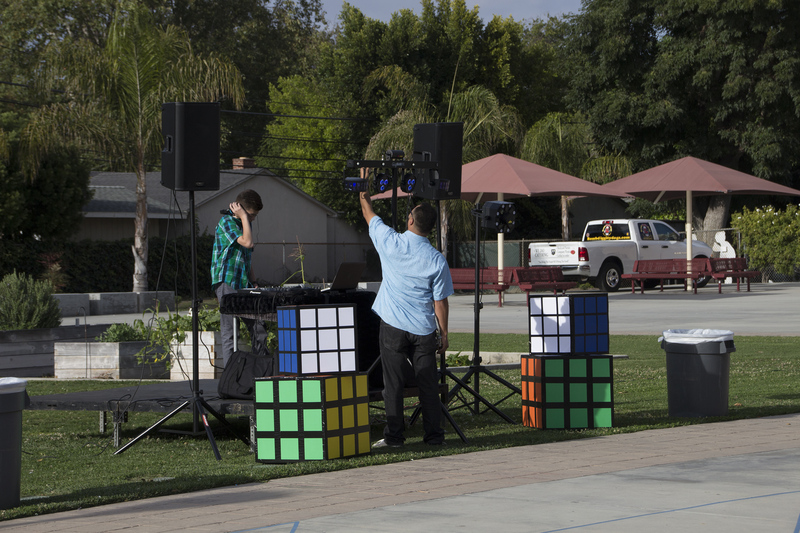 The PTA hired an awesome DJ – Gio who is one of the school maintenance men and well liked by all the students and staff. His music was wonderful and there was a lot of dancing going on! 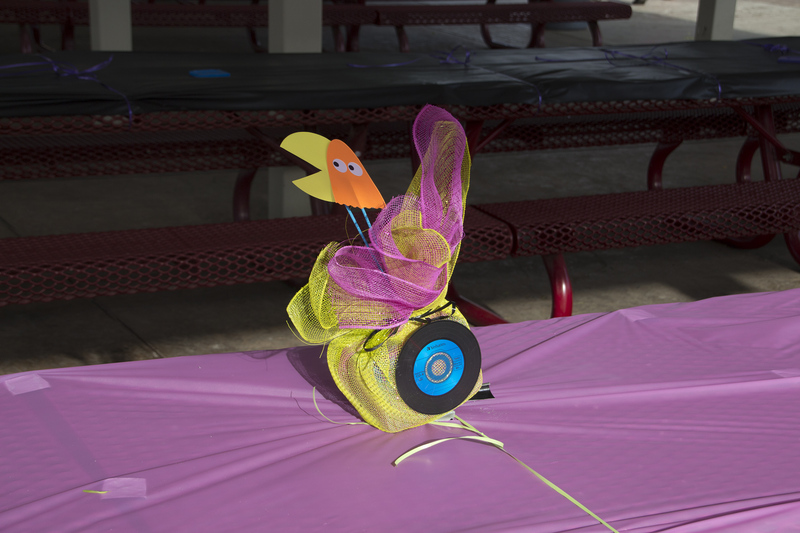 Once again, the lunch tables would be the dining room and the tables were covered in neon table clothes and decorated with centerpieces in matching neon colors and Pacman cutouts. Everything would be perfect. Dinner wasn’t as big of a success as Gio was. 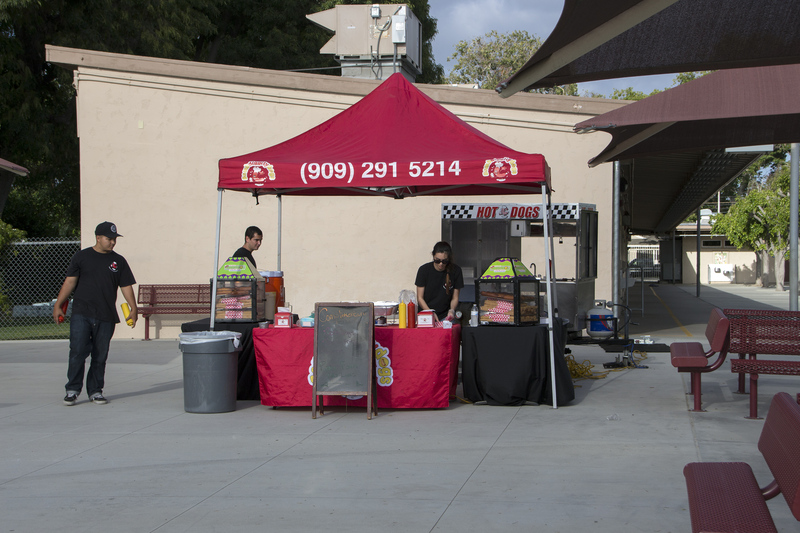 The PTA had hired a hot dog truck to serve corn dogs, french fries and churros for dessert. The perfect 80s meal and they even served lemonade. They came highly recommended and had great reviews on Yelp. They were confident they could easily handle serving about 300 guests in 2 hours. About an hour in Jenna realized that the food line was not moving. They were having problems with their propane but instead of telling Jenna they just tried to fix things but by then they were too far behind to catch up. One of the moms ran out and got pizzas to serve to the dads and daughters who hadn’t eaten yet. I did the pictures again and Jenna and I had decided to use black corrugated cardboard splattered with neon colors for my backdrop! We had so much fun doing it the day before the dance. 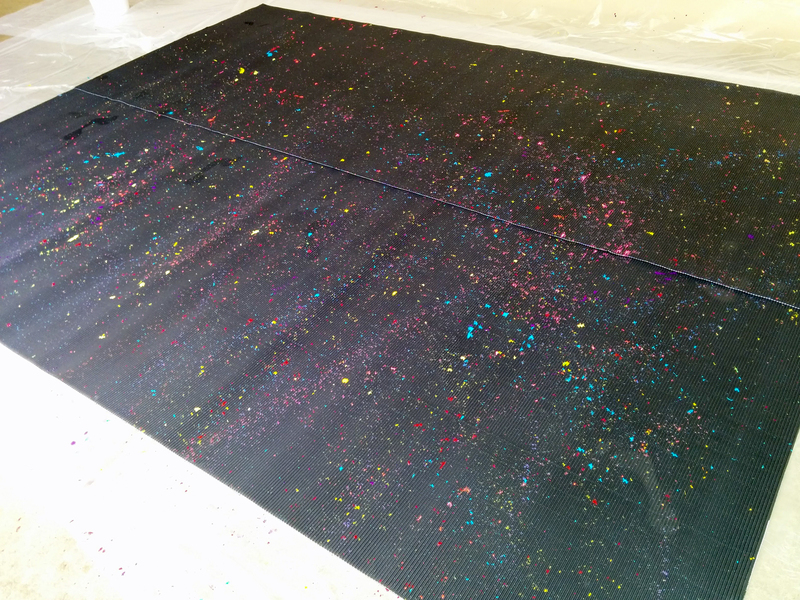 Splattering paint takes you back to your childhood again. We did it at school so that we could leave it to dry flat. We had little ones walking by wondering what we were up to and why we were having so much fun and they weren’t! 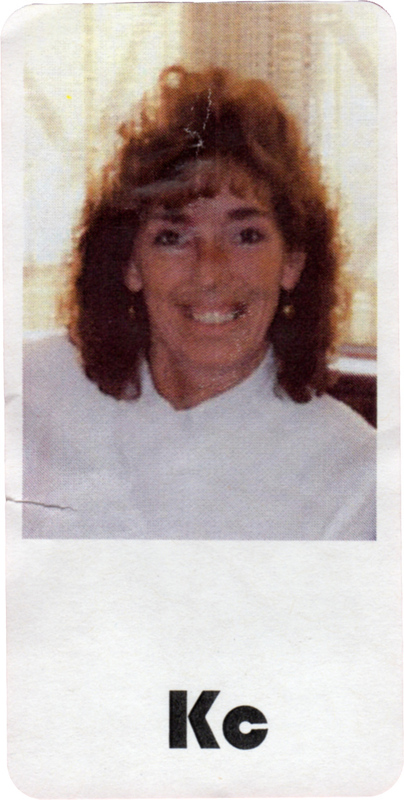 Another little detail – all of the volunteers wore 80s attire and nametags that Jenna had made with a picture of the volunteer from the 80s. This is mine! 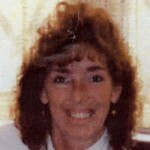 We tried gathering pictures of all of the teachers from the 80s but sadly, we only got a few to participate. Those 5 looked rad and the students loved trying to figure out who was who. Better than all of this is how rad all the dads and daughters looked. Taking the pictures, I get to see how cute everyone looks! This year was the best but I think I have said that every year! But seriously, I have never seen so much neon in one place! Lots of the little girls shared with me that their moms had lots of fun helping them dress 80s and doing their hair! Even I had fun trying to find just the right outfit to wear! It was a wonderful evening. Once again, we had perfect weather and the event was sold out. The hot dog truck made it right on the bill and as a special apology, all of the photos this year were 8x10s instead of the regular 4x6s we usually do. I have loved taking these pictures for the last 5 years and being part of the dance. It has been fun photographing the same dads and daughters and watching the daughters grow. I will miss it. These are the other Father and Daughter Dances Amara has gone to. 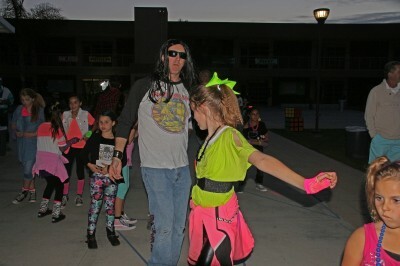 This memory was posted in Special Occasions, Volunteering and tagged Father Daughter Dance, PTA 80s party on June 28, 2016 by Grandma Kc. Awww! I’ve been here for the other father-daughter dances too, and I’m always so touched by how they foster such a necessary relationship! Your themes and decorations have always gone the extra mile. This year, no exception! It was a little bittersweet to read, though. The last big event for all 3 of you ladies. But I think there’s so much more that lies ahead for you and next year this one will be a fond memory with nothing but good feelings. Your 80s decorations were incredible – I love Jenna’s ticket! “Like totally get your card punched…” 🙂 !!! And Amara and daddy are such a cute couple – full of fun and life! You made a cute 80s girl! Looking forward to more of the past few weeks’ events! Monique did a wonderful thing when she orchestrated that First Father and Daughter Dance. I do hope the tradition continues long after we are gone as the girls really do have fun dressing up and spending and evening with Dad. I forgot to mention we did raffle prizes again this year — prizes where Dad and Daughter could have another date! So much more to share! It has been an amazing couple of months! Because this was our last dance Jenna wanted so much for everything to be perfect! My face really did hurt from smiling the next day – so many cute outfits! Not only the girls but the Dads, too! Like you I am hoping that our leaving will just be an opportunity for someone else to step up and make things even better. The new PTA board is very strong and it will be fun to watch what they do to make Santiago even better. That looks like an awesome event for all. 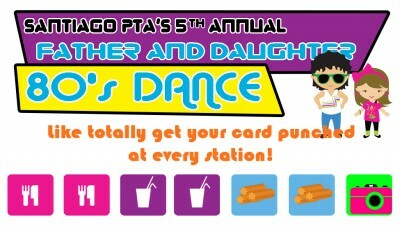 I love the idea of a father/daughter dance. You’re going to miss that school, but I’m willing to bet they’re going to miss you even more. Volunteers like you are hard to come by. I totally missed the earlier post about Amara going to OCSA next year. That is such a great thing for her. I can’t believe she’s already headed for Jr. High. Wow! That was fast. It is hard for me to even say the words junior high or 7th grade! She is growing up so fast! I think she will truly love OCSA and she really is excited about it. It helps that all the 7th graders will be new students. Lots of new friends to be made but we will all miss our Santiago friends. Thank you for taking the time to come back! It really was an amazing event and Jenna really rallied the troops! She was so worried as this was the first dance that she did without Mo but she made Mo proud! I think Amara will miss this next year. What a bittersweet night, knowing it would be the last big event for you and Jenna at Santiago! I’m glad the dance went well in spite of the food service issue. You and Jenna have set a great example of what being involved as parents/grandparents means, and I know the school and students are grateful for all you’ve done. Now it’s on to even more amazing things at OCSA next year! Congratulations on all of the successes you’ve had over the years at Santiago. I’ll sure miss hearing about that school and the wonderful teachers and PTA there. And I know they will miss the two of you in PTA. It was very bittersweet! And it was hard to look at some of those families and know I won’t get to take their picture next year. But I do hope that we have left big shoes that people with even bigger feet can fill! Change can be very good and the new PTA board is made up of some great people. New things will happen but I will miss being part of them. Aw. I wish we have had an event as fun as this when I was a kid. Looks enjoyable. Thanks Lux! The reason this dance happened in the first place was because one of the moms had such good memories of the Father Daughter Dance that she went to as a girl that she wanted to make it happen for her girls! Who knows – maybe one of the students will grow up and orchestrate a F/D Dance for their kids! Oh, this looks like it was a lot of fun (problem with the food cart, notwithstanding)! The nametag idea is really cute! I think everyone had a wonderful time in spite of the food problem. I think Gio and his great music helped! Justin does look rad in that long wig and Amara is the perfect Madonna girl. Reminds me so much of Jenna who would have been about that age in ’85! I’m so far behind I nearly gave up on reading this post! So glad I didn’t! Much to love here! 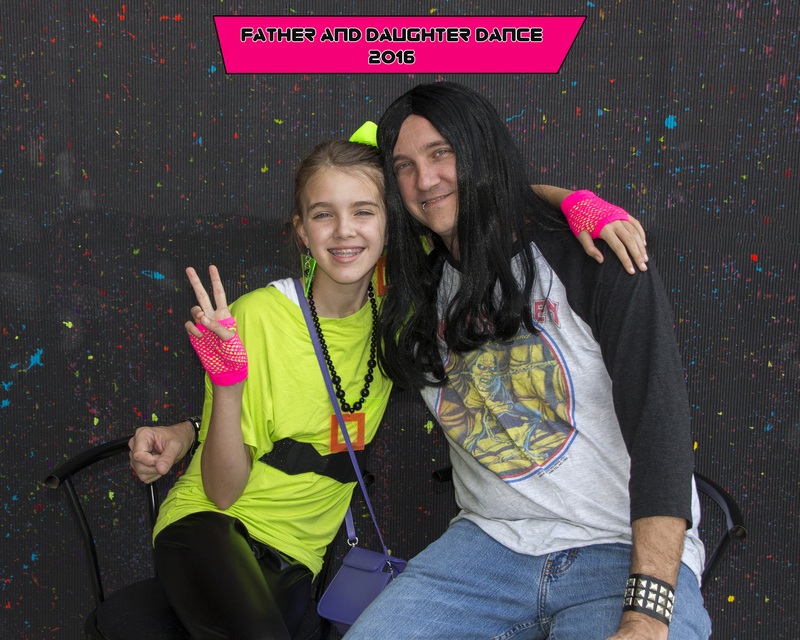 Love your ’80s Amara and Dad dancers! Love that pizza saved the day, er, hungry dancers! Love that you shared yet another sweet memory of moments with Amara. Love, love, love! You have every reason to be behind. I sure hope that Jim is feelings lots better and that he recovers faster than anyone predicts! He has a good nurse!